Justice Prosser concurred, joined by Justice Roggensack (the WLJ is wrong that Justice Roggensack dissented), expressing certain concerns, including the economic effect on the practice of law if the rule encourages parties to act pro se as opposing to retaining lawyers. It’s difficult to oppose a rule which requires a judge to perform his or her duty fairly and impartially, but the concurrence raises an important concern. There are – to overly simplify – two types of pro se parties: Those who cannot afford attorneys and those who can, but chose not to. Yes, this is an over simplification as there are other types of pro se parties – the worst of which are the very few who use the legal system for harassment or other malicious purposes. But, let’s stick to the two most common. For the former type, while this type of rule should be unnecessary, it can’t hurt to remind judges of this obligation. 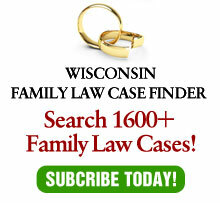 Especially in Milwaukee County, there are substantial numbers of divorcing parties who own nothing, earn little and truly cannot afford legal representation. Legal Aid does not have the resources to represent most of these people. These are the cases for whom the rule is undoubtably intended. It is the latter type, however, which is of concern. There are a certain number of parties who could afford lawyers – and probably should have lawyers- but do not. Some are simply cheap. Others are afraid of lawyers, buying into the common misconception that divorce lawyers conspire to run up costs, rather than helping people identify issues and avoid problems. Not infrequently we get calls from these people after the divorce seeking assistance to correct the mistakes. Usually, it is too late. A few years ago, I wrote column criticizing bar associations which offer free legal services without means testing. Nothing which I have ever written caused more reaction. Some misinterpreted my article, thinking that I was criticizing pro bono services. Maybe that was my fault for not being more explicit. My criticism is not of lawyers performing pro bono services per se – it is for performing pro bono services for people who can afford to pay for a lawyer. I have volunteered for many years for the Milwaukee Justice Center. One reason is they do means checking. In other words, they do not provide free legal services for wealthy people. Of course, judges should be fair and impartial to all who appear in front of them. But, the issue of the legal system encouraging people to act without lawyers is baffling. I’m not saying that the new rule does this, but I am grateful that Judge Prosser recognized the issue.